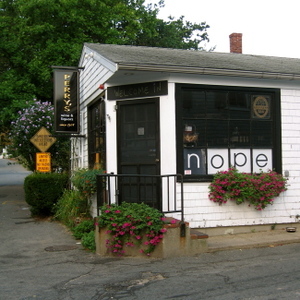 For the past few years, Perry's Wine & Liquors in the West End of Provincetown has been our place to find a fine selection of wines, some great cheeses and (when we arrive before it runs out) French bread from Connie's Bakery. This is a tiny shop but don't be put off by the size of the place or number of items. Everything in their stock has earned it's place. The owners are experienced in matching food and wine. They can suggest something from their stock, based on what you like. They edit their selection the way a sommelier in a fine restaurant sets up a wine list. We don't go into a restaurant expecting to find every wine we've ever tasted. In fact, we're often disappointed to find a lot of well-known brand names. Where's the fun in that? So, at Perry's we open ourselves to the adventure of allowing them to introduce us to a bold red from the Veneto to have with pasta or a New Zealand Sauvignon Blanc that we've never tried with halibut. They deliver orders of $100 or more for free. They also have wine tastings and given some advanced information, will try to find any wine you like. "The West Ender Wines of the Week come from our featured selection of over 100 wines all under fifteen bucks. We call it the best bang for your buck aisle." We've also realized that the good taste they show in wine can be extended to good taste around town. 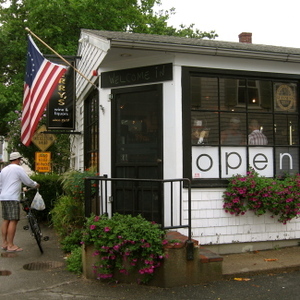 We always ask the owners for their take on Provincetown's restaurants, and where to find the best ingredients for our home cooking. Perry's service is great, the spirit of the place lighthearted and the products outstanding. And, we love the clever window signs that let us know whether they're open or out enjoying some relaxation of their own. We often find parking (or one of us waits in the car) in a tiny parking lot a few hundred feet up Tremont Street. Just go straight instead of around the curve on Commercial Street and you'll see it.